Never attribute to malice that which is adequately explained by stupidity. 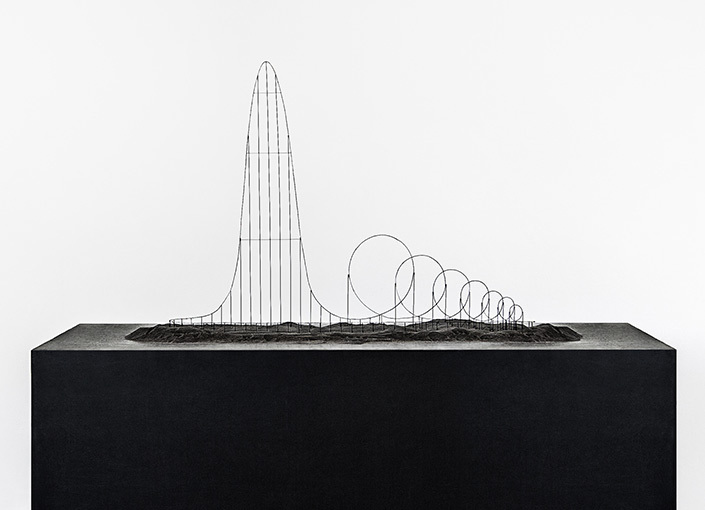 Recently a friend of mine asked me if I had ever heard of The Euthanasia Coaster. Apparently it is a roller coaster designed to end the life of its passengers through cerebral oxygen deprivation brought on by excessive G-force. Passengers are subjected to an initial drop of 1,600 ft (reaching a speed of 220 Mph) before being taken through 10 sequential inversions designed to bring about unconsciousness and death. It is designed for 24 passengers and the ride duration would be about 3 ½ minutes. The coaster is only conceptual in nature and was designed and prototyped by Lithuanian engineer Julijonas Urbonas. Urbonas stated that he wished to create something that would take lives “with elegance and euphoria.” His scale model was displayed at the HUMAN+ display at the Science Gallery in Dublin. As one might expect, the idea has drawn the ire of many anti-euthanasia groups who feel that it might romanticize the idea of suicide. Even assuming a shift in cultural norms would allow such a device to become a reality, I can foresee some ironic red-tape. For instance, to operate they would have to have the apparatus safety inspected and certified for public use. Can you imagine the opening of the roller coaster being delayed because they failed the safety inspection? How would you like to be the guy who has to inform the park owner that he cannot, in good conscious, allow them to operate an intentionally-fatal roller coaster with the structural integrity of the rivets in turn three being in question? Would the ride operators still be required to check everyone’s safety harness to prevent injury? One person, commenting on the concept, expressed concern that he would have to share his final ride with 23 strangers (including one in the seat beside him). I suppose that would be a legitimate concern, especially if the person beside you thought they were getting on a regular rollercoaster and realized their mistake about halfway up the first drop. No one wants to spend their final moments listening to someone having panic attack after they realize that the last rites administered by the park employee was not just a clever gimmick. Despite the macabre nature of such a device, it does have several benefits that traditional roller coasters do not. You can rest assured that there will not be a long line at the souvenir photo booth and your PR department would have to worry about bad press if someone dies on one of your rides. There would be a loss of revenue from the “I survived The Euthanasia Coaster” T-shirts. If such an idea took off, it could become an entire theme park. A Six Flags over Eternity if you will. For instance, the Euthanasia Coaster could be bundled with the Crematorium Log Plume for a comprehensive internment experience. Some might simply prefer to take their chances with the overpriced (and questionably refrigerated) potato salad from the Last Meal Cafe. There would of course be a gift shop for keepsakes and make your own urn station for the kids. There would be no need to license expensive characters like Universal or Disney, just a few characters from Greek mythology for photo ops. It may not be the happiest place on Earth, but I doubt you will hear many complaints. Why Are Drug Reps Hot? 2014 Exceptional Mediocrity. Awesome Inc. theme. Powered by Blogger.